Jumping in place to stay warm, the early morning darkness surrounded us. But the buzz of 1,500 other runners heated the start line. And with the first ray of day, we were off! Running through the rolling desert hills of southwest Utah to the heavenly oasis of Zion National Park. With very little training for my second half marathon ever, I set my sights on just finishing the Zion Half Marathon. I chanted in my mind “light and easy, light and easy,” as a continuously put one foot in front of the other and inched away the miles, a piece of advice I picked up from the novel, Born to Run. If I could keep going, I knew I could finish. I just had to keep moving. And as the pink eastern sky bloomed into a beautiful morning, I rounded the half way point without a single ache. I was ecstatic. Only 6.1 miles to go! By this time the mountains of Zion National Park with bands of colorful rock lay about on all sides. The desert grasses and red rocks danced to the oldies classic chirping through my ear buds. And as the town of Springdale approached for the last 5k to the visitor center, I picked up the pace with a bit of swagger, passing runners on a long uphill portion. Driving forward on the last stretch, the cliff valley of Zion greet me like family and the cheers of the townies, support of my fellow runners and my unstoppable stubbornness pushed me through the finish line. In a woozy haze, I stopped my sports watch and stared in awe. I set a new personal best with 2 hours, 18 minutes and 6 seconds – there is nothing like stunning scenery to get you motivated! If you are looking for a great reason to run and mini-vacation, I highly recommend registering for one of Vacation Races’ National Park Half Marathons. I loved this race so much that I signed up for a second later this summer. In August, I’ll run the Rocky Mountain Half Marathon, which features a killer 13.1 miles at 7,500+ feet. I think I might be crazy, but no matter what it will be a crazy, fun adventure in Colorado. 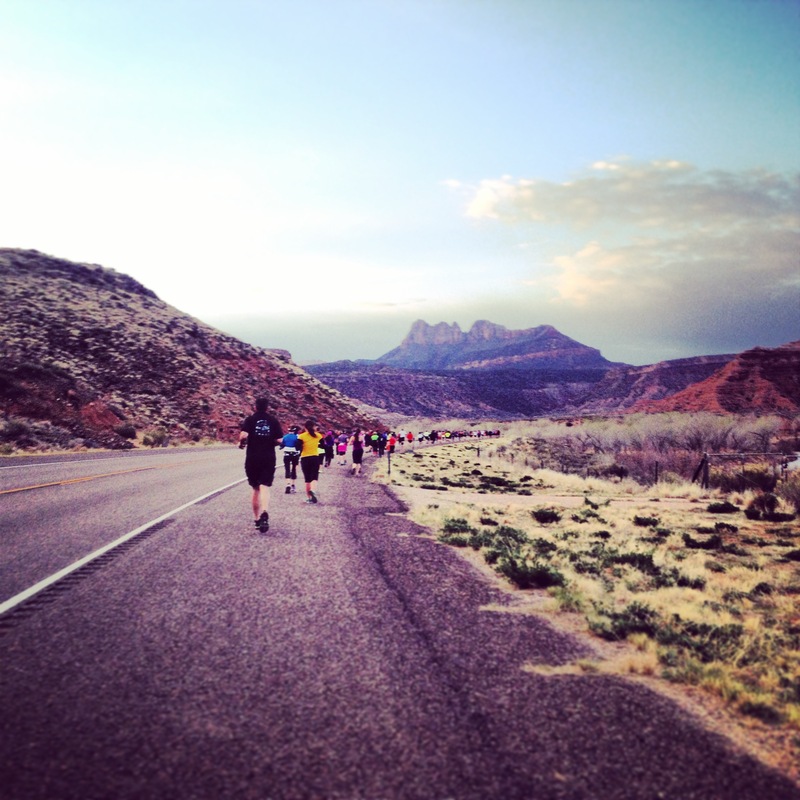 Check out the video from this year’s Zion Half Marathon. But warming, this video will make you want to run! What is the most beautiful place you’ve ran? A sunrise to remember always.